For Greek myth fans, those who can’t get enough of the D'Aulaires' Book of Greek Myths, and readers who have aged out of Rick Riordan, this classroom staple and mythology classic is perfect for learning about the ancient myths! As the gods and goddesses of Olympus scheme, the ancient world is thrown into turmoil when Helen, the most beautiful woman in all of Greece, is stolen away by her Trojan love. Inflamed by jealousy, the Greek king seeks lethal vengeance and sends his black war ships to descend on the city of Troy. In the siege that follows, history’s greatest heroes, from Ajax to Achilles to Odysseus, are forged in combat, and the brutal costs of passion, pride, and revenge must be paid. In the end, the whims of the gods, the cunning of the warriors, and a great wooden horse will decide who emerges victorious. Homer's epic poem, The Iliad, is one of the greatest adventure stories of all time and Rosemary Sutcliff's retelling of the classic saga embodies all of the astonishing drama, romance, and intrigue of ancient Greece. Don’t miss The Wanderings of Odysseus, the companion to Black Ships Before Troy, and follow Odysseus on his adventure home. 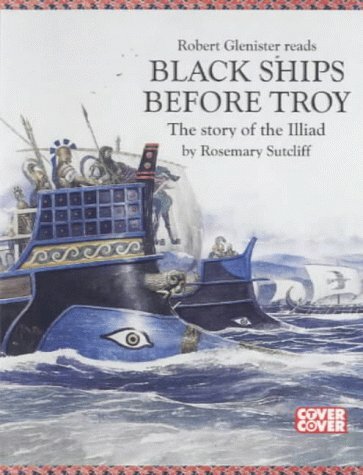 This book has been selected as a Common Core State Standards Text Exemplar (Grades 6-8, Stories) in Appendix B.
Homer's epic poem, The Illiad, is one of the greatest adventure stories of all time. In it, the abduction of the legendary beauty, Helen of Troy, leads to a conflict in which even the gods and goddesses take sides and intervene. It is in the Trojan War that the most valiant heroes of the ancient world are pitted against one another. Here Hectore, Ajax, Achilles, and Odysseus meet their most formidable challenges and in some casas their tragic ends. Rosemary Sutcliff wrote more than 40 historical novels for young adults, including The Wanderings of Odysseus and Black Ships Before Troy, as well as five adult novels, and several books of nonfiction.